Mechanical vibrato systems for guitars date back to the 1930s. They weren't very good then, and they were not much compared to what came a decade later. They did do one great thing: They inspired superior machinists and mechanics to create increasingly better equipment. I mean no disrespect to the Doc Kauffman designs seen on some Epiphone guitars from 1935 through 1937. The Kauffman vibrola was groundbreaking in a manner similar to Henry Ford's Model T. The facts are, however, that what became available later was and is far superior. The Bigsby vibrato tailpiece was the first commercially successful vibrato system for guitar. Perhaps a comparison to Henry Ford is more accurate with Paul Bigsby. The Bigsby device is still very much in demand today. The Bigsby system was a design from the late 1940s. Mr. Bigsby had specifically designed his vibrato machine for the great Merle Travis. Merle was one of the most influential American men to have ever played a guitar. He's not really remembered for using the Bigsby, but for his famous "Travis picking" style. Chet Atkins was inspired when he heard Merle Travis's music on the radio, and would become known for his gentle and tasteful use of the Bigsby vibrato device. These whammy bar devices are mostly used by blues and various and sundry rock guitarists today. It was the late Lonnie Mack who brought the Bigsby into the blues and rock fold. One extremely interesting tidbit concerning the original Bigsby vibrola is its compression spring. The only compression spring Paul Bigsby could find was one designed by Harley Davidson, the motorcycle folk, as a valve spring. The Bigsby device is instantly recognizable. You simply can't miss it. I've heard people describe them as being absolutely beautiful, and I've heard people liken having a Bigsby on your guitar to having big fancy wheels on your car, or wearing big gold chains around your neck. Bigsby equals bling, is the theory there. Another potential reason to want a Bigsby device is some say they add sustain to the guitar. Myself, I'm not absolutely certain this is true. I'm in no position to say it isn't true either. What I know to be true is many people believe it to be true that a Bigsby adds sustain to a guitar. 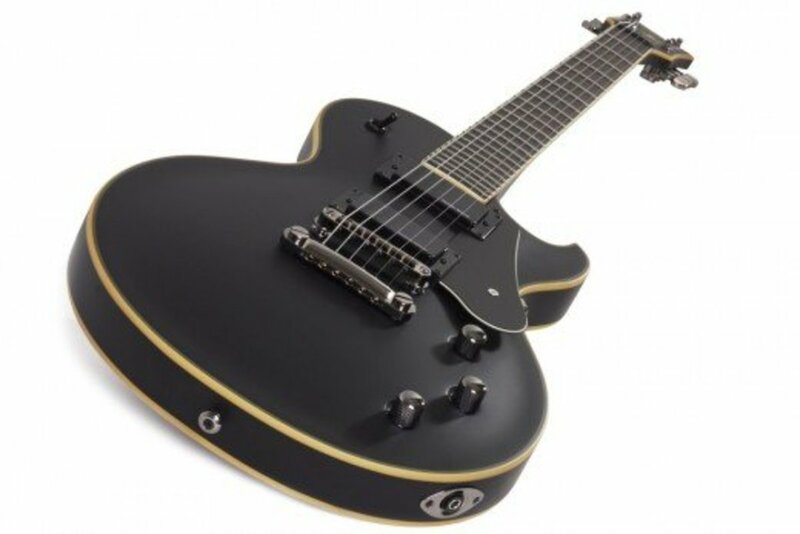 The notion of added sustain is a very good reason to want a thing, anything, on a guitar. People want different things for different reasons. If you ask me, the number one reason to get a Bigsby on a Les Paul is because the Bigsby is all on top of the guitar. You can take it right off of there, and put the regular Tune-O-Matic and stop-bar on the thing. Then later on, you can put that Bigsby back on the guitar. A Bigsby on a Les Paul doesn't have to be a permanent thing unless you want it to be. The Gibson Lester Paul Fort Knox was a limited run from the year 2016. When I first heard about it, I thought, 'oh my goodness! They're going to make another twenty thousand dollar guitar.' This isn't the case at all. This is the least expensive of the LPs with a Bigsby vibrato. More than anything else the Fort Knox is a 50s gold top style LP with a lot more gold coloring and a Bigsby vibrato. The gold top LPs were early LPs where the necks were very fat, and the maple top's figuring and such weren't so important. The gold finish, like the black finish on the LP custom guitars, blocks out the figuring of the maple. 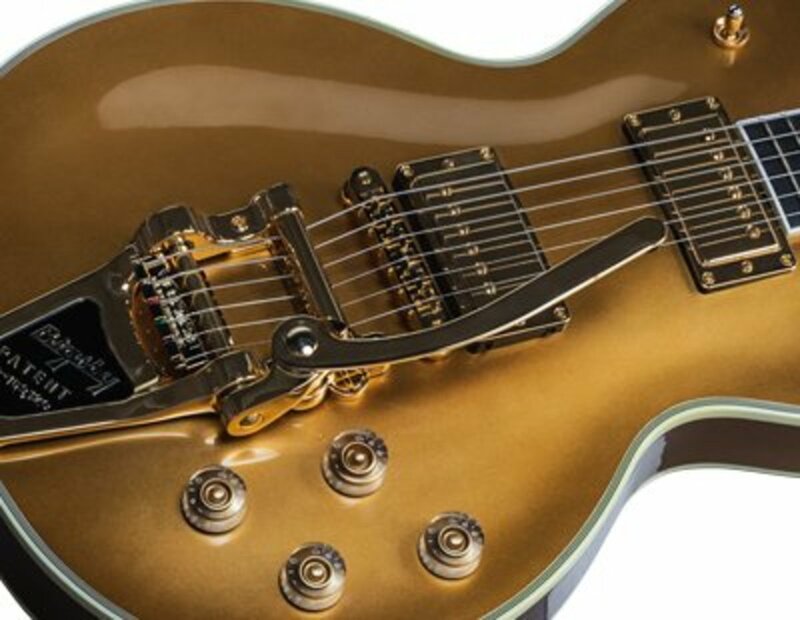 This is more like a Les Paul Custom than the typical gold top Paul. The binding here is excessive, and like a Custom, there is the split diamond inlay on the head-stock, and the full decking out of the fingerboard with positioning marker inlays. Those fingerboard inlays are blocks instead of trapezoids, another nod to the 1950s. Everything is gold here. The tuning machines are gold, the Bigsby is gold, the frets are blinging out in gold, the top and the back are gold too. The switch tip is gold, the strap lock is gold. This is a gold lover's goldmine. Four thousand bucks. There were one hundred and fifty of these produced in 2016. Every Les Paul will be a tonal monster, and this one is a visual stunner as well. The Bigsby here has the vibramate. This is an upgrade from the typical Bigsby. It's like a Bigsby plus, plus the gold. The Vibramate helps the durn thing to stay in tune, and facilitates string changes. The Les Paul Supreme Florentine is all about that maple top. With this guitar you get absolutely stupendous maple on the top. The top is AAAA grade maple. That's hella flame figuring. When you look at the cost of this guitar, that AAAA grade maple is a major part of that. 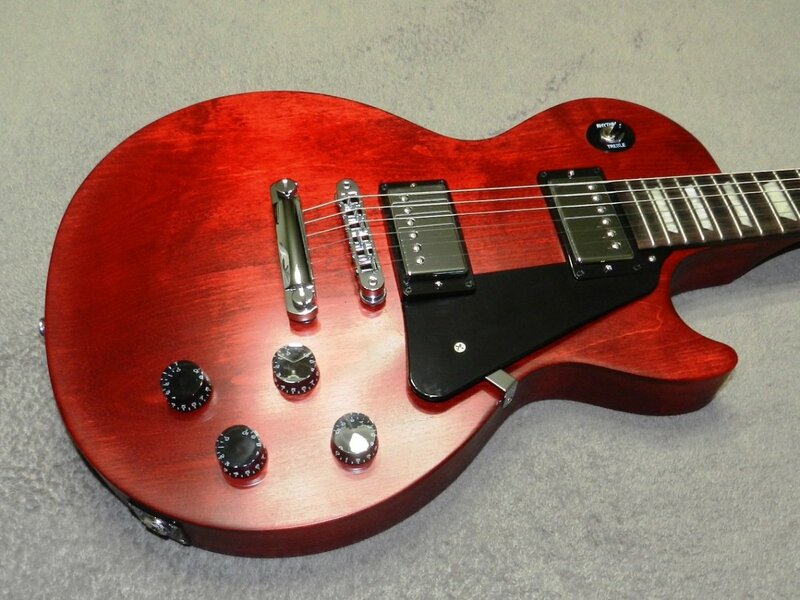 This is the kind of Les Paul Gibson puts together to compete against some of those Paul Reed Smith '10 Tops' which people covet so dearly. Still not done talking about that AAAA maple. This is not a single cap Les Paul. In fact, this is a double cap Les Paul. What on Earth am I talking about here? There is that AAAA grade maple cap on top, you can see that. You look at the back of this guitar, and there is a AAAA grade maple cap with the exact same finish on the back too. This is not common at all. You look at this guitar sideways and it looks like some sort of psychedelic cream cookie. The mahogany center is buffed and clear coat finished in a very creamy sort of way, and sandwiched on either side by the two maple caps of Caribbean Blue. It is visually spectacular in every way. These were Gibson 2015 guitars. That hologram inlay on the headstock is pretty special, as is the double maple caps, and the color finish. The supreme Florentine won't be easy to find, and I suspect the asking prices will rise. Are you a tonewoods believer like me? If so, the double helping of maple may well make this a crisper sounding Paul than usual. Collector's Choice™ #14 1960 Les Paul "Waddy Wachtel"
3. Gibson Collector's Choice #14 1960 Les Paul "Waddy Wachtel"
Waddy Wachtel is a great American sessions guitarist. I first became aware of Waddy from his work with Keith Richards and Keith's solo records. He's recorded with a lot of big name stars, and if you are a rock music fan at all, then you've almost certainly heard his guitar playing. Waddy is also known as Bob Wachtel, and so if you are the sort of person who reads the notes on the inside of albums, you may see mention of him in that manner too. Waddy has also appeared in some films. He's a distinct looking person. He's also had some distinction in his criminal history. Here we are concerned primarily with his work as a musician. He's a great blues rock guitarist. You don't get to be one of Keith Richard's favorite people otherwise. Waddy has always primarily played two great guitars, a Stratocaster, and a 1960 Gibson Les Paul. 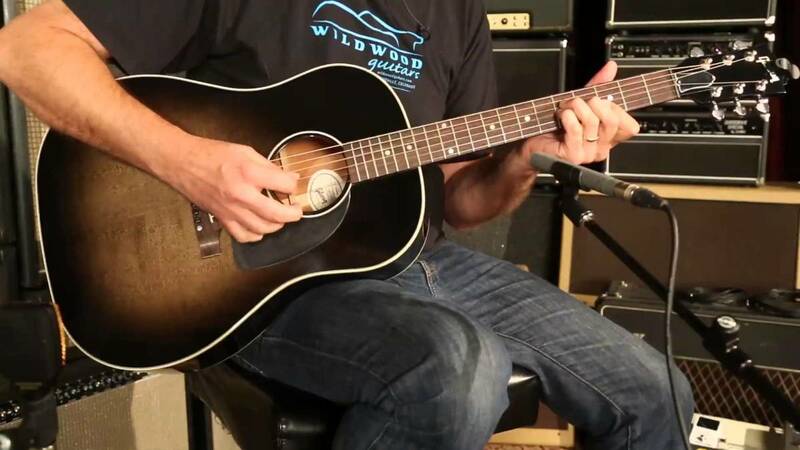 This is one of those guitars where the people at Gibson bust out every scientific instrument they have in order to perfectly recreate, to the best of modern technology and crafts-person's ability, the exact guitar Waddy Wachtel plays. It is very important here a body realizes the necks of Gibson Les Paul guitars in 1960 were very much thinner than those from the 1950s. There is no better or worse about it, there is only the matter of a person's hands, and which style feels right to them. The Waddy Wachtel guitar has a thinner neck than the previous two guitar's discussed. Gibson Custom analyzed the sound of the original PAF humbucking pickups and re-created that vibe with a pair of Custom Bucker humbuckers. These pickups use period-correct wire and a precise number of turns to create the tone we all know and love. You'll love the tight low end, complex midrange, and the sweet highs that you'll get out of the Custom Bucker pickups - and these pickups are only to be found on this exact guitar. There were exactly three hundred of these produced. You will notice the Bigsby on the Waddy guitar is without the vibramate. Wachtel is an old school classic blues rock guitarist, and so he's got an old school Bigsby on his famous and heard around the world Les Paul guitar. Now a Floyd Rose system is nothing at all like a Bigsby. With the Floyd one can do as subtle a vibrato as Chet Atkins would have loved, or one can go full out Edward Van Halen with these. You can simulate dive bombing London with one of these. As with all Floyd Rose systems, there is the locking nut in place to ensure the guitar stays in tune as much as is possible. 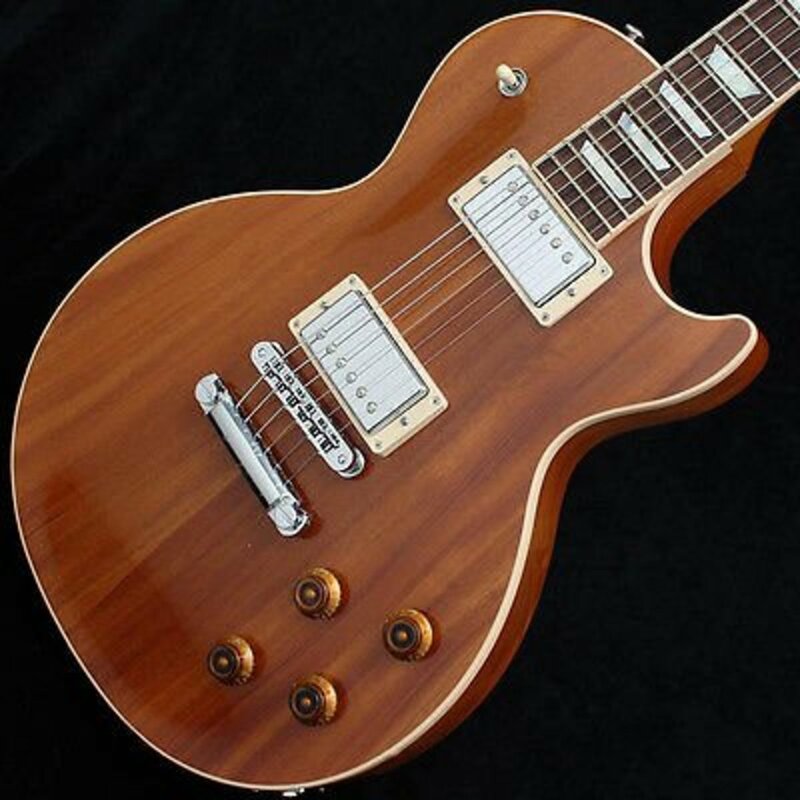 While the Gibson Les Paul Axcess guitar sports what looks from the front to be a traditional Les Paul neck joint, the neck heel and portions of the back and neck joint at the upper cutaway have been contoured to provide a "heelless" feel and an unimpeded reach right up to the 22nd fret. No more stretching against the traditional neck heel to achieve the upper-fret access that your lead style demands-the Gibson Axcess guitar gives you that sought-after Les Paul play-ability all the way up the neck, and welcomes you to take it right over the top. The heel and access contour are not the only differences to the body with these guitars. There is also what is known as the belly scarf, or ribcage contour. You have a somewhat thinner body than is typical for an LP, and the body is chambered for weight relief. The pickups are 498T and the 496R. These pups are both equipped to be tapped or split. This is one of the most versitile and playable of all Les Paul models, it's just not so traditional. These guitars are Gibson's answer to the super strats available. The advantage is only a Les Paul ever sounds like a Les Paul, so here is your shredder's Les Paul. The Alex Lifeson Axcess is very much an Axcess Standard with more bells, and more whistles. To my way of thinking, this guitar is the single most versitile Gibson Les Paul in production. This is less than a thousand dollars more than the Axcess Standard, but for the extra money, you get a lot of truly cutting edge features. Just like the music of Alex Lifeson and Rush broke new ground in the realm of classic rock, the Alex Lifeson Axcess breaks new ground with what one can get out of a Gibson Les Paul. This guitar has the axcess heel, the belly contour, the Floyd Rose with locking nut; and then it goes way beyond the pale from there. This is a Lester with coil taps, but splitting the humbuckers is common fare in comparison to the Piezo system and the ghost pickups under the saddles. You read that right, there are more pickups here than you can even see without looking very close. The ghost pups allow for this guitar to, in a manner I find very mind blowing, emulate the sound of an acoustic steel string guitar. This instrument embodies amaze balls levels of tech, we live in an age of technological wonders, and insofar as guitars go, this one right here is one of those wonders. This LP, for all the world, can sound like a steel string acoustic flat top. There is then the feature allowing you to take the two humbuckers into either series or parallel. 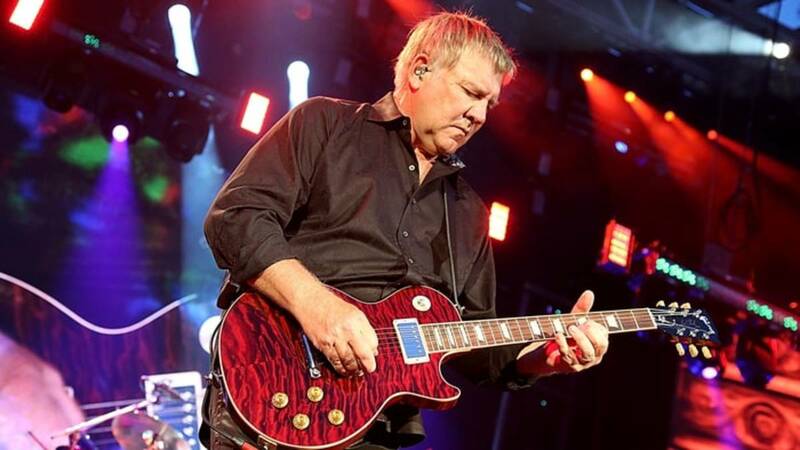 Alex Lifeson is a special guy, for sure, but this guitar is over the top with wizardry. 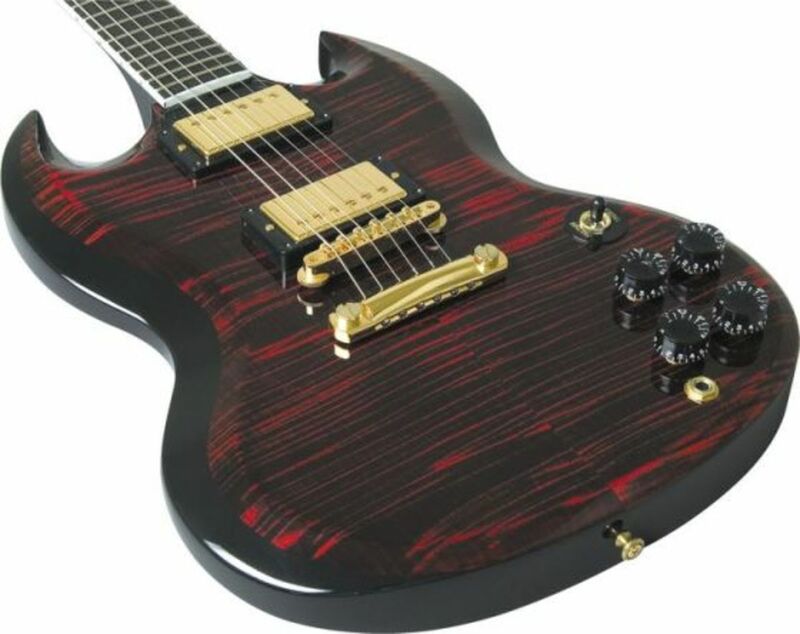 You can see the price, the Alex Lifeson Axcess isn't cheap. What it is, is that one guitar which can cover more bases, produce more differing tonal characters than any other I can think of. If I were a professional musician, this would be the number one instrument I'd own and use, as it can be used for any and all styles.